Is there really such a thing as over-brushing your teeth? If you’ve ever dealt with tooth sensitivity, gum pain, or a cavity, you may have been tempted to brush your teeth a little harder in hopes that it would help. In fact, over-brushing or brushing your teeth too hard can contribute to some of the tooth sensitivity you’ve been experiencing! Tooth sensitivity is caused by dentin, the material our teeth are mostly made up of, losing its protective enamel covering. The dentin, which contains microscopic nerve endings, is then exposed to the elements. Hot, cold, or acidic foods then become unbearable to ingest without causing pain. Over-brushing your teeth or brushing your teeth too hard can cause that protective enamel to be worn away over time. Another way that dentin can be exposed is by the recession of the gum line that is generally caused by gingivitis. Gingivitis is an inflammation of the gums that is the first stage of gum disease. 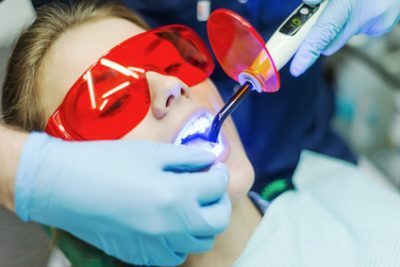 Gingivitis is generally caused by poor oral health and can progress to the more serious periodontal disease, a severe gum disease that can result in infection and the loss of teeth. Having gingivitis can play a part in having sensitive teeth as well. It’s important to maintain a healthy oral health regimen to help protect from gum disease. It can be overwhelming to hear about all the things we do (or don’t do) that can negatively affect our teeth. Sensitivity in teeth is not something easily ignored. Pain, when brushing teeth or eating favorite foods, is a symptom that people with sensitive teeth cannot ignore. If you have sensitive teeth, the first thing that you should do is consult your dentist. Your dentist will examine you to determine the cause of your sensitive teeth. If you do have gingivitis, don’t panic! Gingivitis can be reversible. It’s imperative that you see your dentist to determine that main cause of your sensitive teeth and determine the best course of action. There are also some preventative measures you can take to prevent future tooth sensitivity or tooth decay. If you feel like you may be brushing your teeth too hard, try switching over to a soft-bristled toothbrush or electric toothbrush. Both options help control how hard you brush your teeth and prevent unnecessary wear and tear on the enamel of your teeth. Make a conscious effort to cut back on highly sugary food or beverages. If you do have food that is high in sugar, chew sugar-free gum afterward to help clean teeth. Stay on top of oral health routine by brushing twice a day and flossing daily. Stay current on your regular dental cleanings, aiming for at least having your teeth professionally cleaned twice a year. If you have sensitive teeth, don’t suffer through it! Give us a call at HPS Advanced Dental Care today at (248) 652-0024 to schedule an appointment!